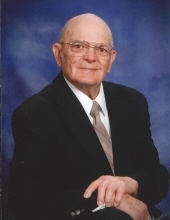 Celebrating the life of William Doering Jr.
Obituary for William Doering Jr.
William (Bill) O. Doering, Jr., age 87, longtime resident of Ponca City, Oklahoma, passed away Tuesday, March 19, 2019, in Ponca City. Friends and loved ones may pay their respects at the funeral home on Monday, March 25, from 1-8pm with the family present to greet friends from 5-7pm. A funeral ceremony to gratefully remember Bill's life will be held at 2:00 pm, Tuesday, March 26, 2019 at the First Lutheran Church with Pastor Marvin Henschel officiating. Following the ceremony, Bill will be laid to rest next to his wife Dorothy at Resthaven Memorial Park in Ponca City. His grandchildren will serve as casket bearers. Arrangements are under the direction of Trout Funeral Home & Crematory. Bill was born on April 7, 1931 to William Otto Doering, Sr. and Louise Elizabeth Werner Doering in Galveston, Texas. He was raised in Galveston, graduated high school from Concordia, Austin in 1946. Following high school, he began his lifelong passion for education and faith. His first teaching assignment was at age 19, in a small Kansas town where he was responsible for teaching first through 12th grade. Hitchiking back and forth from Galveston to Chicago, he attended Concordia Teacher's College in River Forest, IL where he received his bachelor's degree. While at Concordia, he met the love of his life, Dorothy Jean Emling. They were married on June 14, 1953 in Bad Axe, Michigan, celebrating nearly 60 years of marriage before her passing in May of 2013. Later, Bill received his Master's from Oklahoma State University. Bill’s skill for administration was quickly recognized. Following in his father's footsteps, he served as principal for Lutheran Schools in Galena Park and Odessa Texas ending up at First Lutheran in Ponca City. Devotion to the students and congregations supporting the schools are hallmarks of his character. Yet, Bill still found time for not only his family, but also was able to keep his fishing pole in use. Frequent trips to the local fishing holes provided him respite from the intensity of his work. As well, Bill enjoyed tending to the soil and growing vegetables in his garden to enjoy the earth's bounty and share it with others. During his upbringing he took on several diverse jobs including painting greenhouses, short order cook, door to door magazine sales and working on a tug boat throughout the Ohio Valley and Southern Inter-Coastal waterways. First Lutheran Church has been Bill's Church Home for decades. At the church, William served as lay minister under Pastor Marvin Henschel. The Tuesday morning bible study group was one of the highlights for his week. He formerly served as the principal at the First Lutheran School. He served in various leadership positions within the church and the Directors of Christian Education for the Missouri Synod of the Lutheran Church in Texas and Oklahoma. Bill's leadership effected many students through the years setting them off into life with a solid educational foundation. His children sermons were accented by his clever use of paper cutouts. Survivors include his children: Cindy Jackson and husband Chris of Oklahoma City, Tim and wife Kathy of Owasso, William III "Bill" and wife Kim of Cleveland, OK; siblings: Elizabeth Crofford of Dallas, TX, Marvin Doering and wife Joyce of Portland, OR; grandchildren: Tommy Jackson and wife Samantha, Matthew Doering, Michael Doering and wife Rachel, Steven Jackson, Melinda Doering, William Jackson and wife Alicia, and Isabella Doering; great grandchildren: Katie, Olivia, Henderson Vincent, Aidan, Natalie, Janelle, Jack, Carson, Cooper, Silas and Kaley. William was preceded in death by his parents, wife Dorothy, brother Curtis Doering, and brother-in-law Dr. William Crofford. In lieu of flowers, memorial donations may be provided to the First Lutheran School, 1104 N. 4th St., Ponca City, OK 74601. To send flowers or a remembrance gift to the family of William Doering Jr., please visit our Tribute Store. "Email Address" would like to share the life celebration of William Doering Jr.. Click on the "link" to go to share a favorite memory or leave a condolence message for the family.